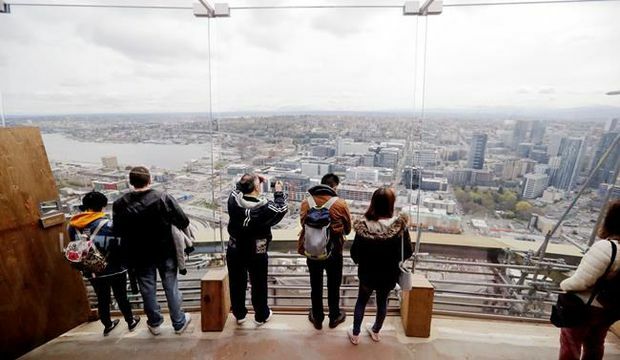 Space Needle visitors look east through newly-installed glass panels to Seattle below. The landmark has undergone its biggest renovation in its 56-year history, a US$100-million that transformed the structure's top viewing level. Vancouver architect Michael Geller has seen some remarkable buildings around the world during his decades-long career. Most recently, he visited Astana, which is home to the newly built Bayterek Tower. The structure is 97 metres tall, its height representing the year 1997, when Astana was named Kazakhstan’s capital. At the top is a golden sphere surrounded by pointed spires, a reference to a local folktale about a bird that lays its egg in the sacred tree of life, a story about new beginnings and finding happiness. Although the Bayterek Tower doesn’t hold any world height records, it attracts and inspires Kazakhs and visitors alike, with an observation deck within its golden orb that allows people to see a modern-day, master-planned city within a region steeped in history. 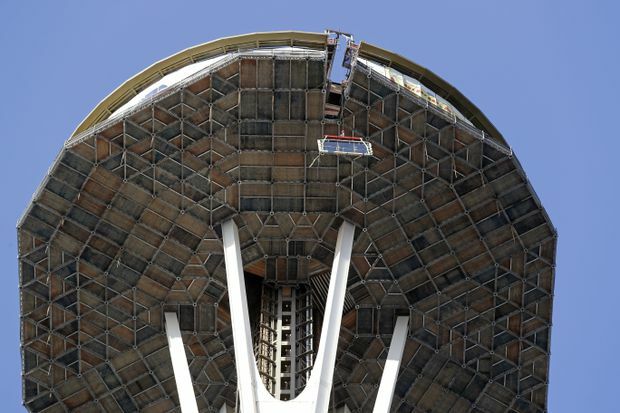 The extensive renovations to the Space Needle in Seattle had to pass through the city’s Landmarks Preservation Board to ensure the recognizable profile wouldn’t be altered. “Even going back to the Middle Ages, towers were seen as a symbol of prestige and power, and I think that that tradition has continued over the centuries,” Mr. Geller says. The current world title for the tallest skyscraper goes to Dubai’s Burj Khalifa, at 828 metres. But it will be knocked off its throne in 2020 when the kilometre-high Jeddah Tower opens in Saudi Arabia. In this age of escalating heights, there’s a push in North America to keep existing towers relevant, to ensure their significance isn’t reduced. Take the Space Needle in Seattle. Last year, its owners announced extensive multiyear renovations to preserve and update the 184.4-metre-tall tower, which was constructed for the 1962 World’s Fair. The US$100-million first phase is nearly complete, with slanted floor-to-ceiling windows and an outdoor observation deck featuring open-air glass walls and glass benches. Two interior observation levels will be connected by a striking wood, steel, and glass staircase, the lower level being the world’s only rotating glass floor, meaning you can stare down the tower itself all the way to the ground. Look out and you have 360-degree views of the city and Puget Sound. Karen Olson, Space Needle chief marketing officer, notes that the upgrades all had to be approved by Seattle’s Landmarks Preservation Board. This was to ensure that the tower’s profile wouldn’t be altered, given its instantly recognizable profile with its saucer-shaped top. 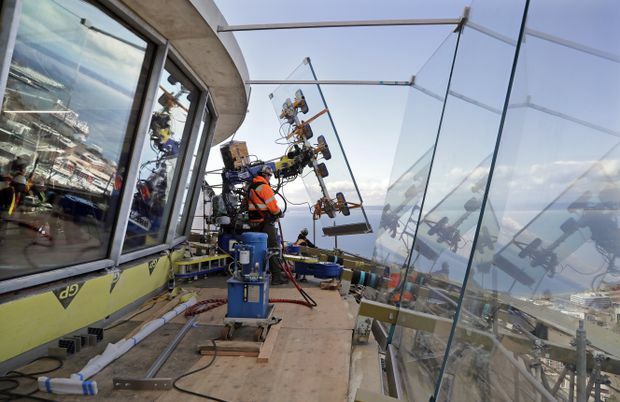 A 900-kilogram glass panel is moved into position on the Space Needle's observation deck in Seattle. The landmark has new floor-to-ceiling glass in the observation deck and its restaurant has been remodelled in the first phase of the renovation. In addition to the need for physical and electrical upgrades, a driving factor for the enhancements was to keep the Space Needle’s status and significance entrenched. Nonresidents know it as a tourist attraction, but to the people of the Emerald City, it’s much more. “We wanted to ensure it’s just as relevant in 2062 as it was in 1962,” Ms. Olson says of renovations that are being called the Century Project. “When it was built in 1962 it was modelled after the Eiffel Tower, in that it really marks the skyline. Seattle in the late ’50s was a growing city, but we weren’t well-known at all. ... The idea was to put the city on the map. Canada’s most iconic structure, Toronto’s 553-metre-tall CN Tower, is also being refreshed, with a complete overhaul of its main observation level. New floor-to-ceiling glass window walls have been installed to open up views that stretch out to Niagara Falls and Rochester, N.Y. Multiple food hubs have replaced a single restaurant. There’s not one but two glass floors, with one on top of the other. The tallest free-standing structure in the Western hemisphere, which was built in 1976 by Canadian National Railway and is now owned and managed by Canada Lands Co., has had technological upgrades as well, most notably the implementation of a viewfinder app that allows people to create a kind of virtual reality on their mobile devices. Accessibility has been improved, too, with wider spaces that are easier to navigate. The refreshed CN Tower remains a popular tourist destination, attracting a record 1.98 million visitors last year. To connect with people across the country, the tower is illuminated on any given night in different colours to support various events or causes, from Canadian Football League and National Hockey League victories to National Aboriginal Day, Canadian Forces Day and health-related awareness campaigns; some nights, two organizations are recognized by the tower glow. It seems to be working. Last year, the tower experienced its busiest year on record, with approximately 1.98 million visitors. The CN Tower not only marks the Toronto skyline but has also become a symbol of the entire country. The 50-year-old Calgary Tower, left, isn’t the biggest building on the city skyline but it remains relevant and, like other towers, plays ‘an important role in the architecture of a city,’ one observer says. Mr. Geller notes that what distinguishes structures such as the CN Tower, the Space Needle and the Calgary Tower from office buildings that boast great heights — such as the Petronas Towers, twin skyscrapers in Kuala Lumpur — is that they’re open to the public. This year celebrating its 50th anniversary, the Calgary Tower is wrapping up improvements to its observation deck and will soon unveil a new, immersive multimedia feature. The Olympic torch, which is situated at the tower’s peak, is lit during Olympic Games’ opening and closing ceremonies and anytime a Canadian athlete wins a gold medal. In 2014, exterior LED lights were added, allowing for the same kind of colourful acknowledgments that the CN Tower displays, whether it’s to cheer on the CFL’s Calgary Stampeders or to raise awareness of certain kinds of cancer. “The lighting helps re-establish the sense of community the tower brings to the rest of the city,” says Calgary Tower president and chief executive officer Greg Guatto. “We’ve been investing in this property because we’re proud of it. Citizens of Calgary are proud of it. It really is right in the centre of the city, and you can see those lights from anywhere. If you watch Hockey Night in Canada, it’s always on the opening segment. The Burj Khalifa in Dubai is the world's highest skyscraper with a height of 828 metres. But it will soon be eclipsed by a kilometre-high structure in Saudi Arabia. With so much money being poured into modernizing and enhancing so many North American towers, luring people in — or rather up — is clearly the ultimate goal. The question may be: What continues to fascinate human beings about these types of buildings? New, thrilling opportunities to stand on a glass floor high above the ground are a draw, particularly in an era when simply being up high in the sky is increasingly common. But a tower’s appeal may go deeper than that. “Increasingly, a modernization or updating of these old towers involves creating glass floors and other things to offer an exhilarating experience,” says Mr. Geller, the Vancouver architect.